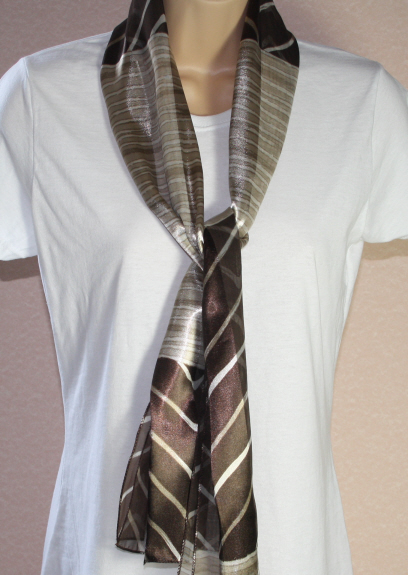 Brown Striped Ladies Scarf. Black, brown and white scarf with horizontal stripes. Long straight scarf. Ladies Earth Coloured Scarf. A striped scarf with black, browns and cream colours. Long straight scarf. Animal Striped Brown Scarf. A brown and cream animal stripe design scarf. Long straight scarf. Ladies Blue Brown Scarf . A golden brown ladies scarf with threads of blue running through the material. Long straight scarf.